City Law student Hannan Hashmi (LLB Law) was crowned the winner of Made@City, an annual event showcasing student final year work. Twenty eight students exhibited their projects at the event, that included chocolate cookies made from insects, virtual reality computer games and an audio visual artwork exploring the legacy of Freddie Mercury. The event was a chance to show the quality, hard work and innovation of student work at City. Attending guests were given a voting token and asked to pick their favourite exhibitor on display. Hannan Hashmi’s was named ‘innovator of the year’ for his project Codify Law, with Felipe Piai (Electrical and Electronic Engineering) and Sean Looij (Biomedical Engineering) named as runners up. I am delighted to see Made@City return bigger and even better than before. This year’s event brings City and Cass students, staff and alumni together with London business and professional leaders to explore the innovations and technologies our students have developed over the past academic year. Made@City also provides students with an opportunity to build personal networks, deepen their skills, and share their strengths – key preparations for their professional careers. Codify Law is an artificial intelligence powered contract analytics platform which halves the time needed for small and medium sized enterprises (SMEs) and high street law firms to complete the contract review process. Hannan created this platform during his degree course as a way to improve the sometimes lengthy legal process. The platform works by highlighting key points of contention in legal contracts that do not align with an organisation’s predefined objectives. These highlighted points are then categorised according to priority and impact. Artificial intelligence is used to amend these contentious clauses and to improve the accuracy. 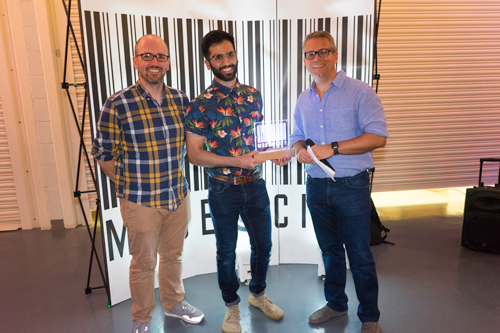 Hannan Hashmi was crowned ‘innovator of the year’ and awarded the top prize of £1,000. Felipe’s project used 3D printing materials to develop a modular robotic arm, controlled by electromyogram (EMG) signals recorded directly from the muscle. This 3D design would allow prosthetics companies to save time, greatly reducing the waiting time for prosthetic development. This process would also help companies save money as the full working prototype was developed for less than £90. This is one thirtieth of the price of current prosthetic limbs on the market. Felipe was a runner up taking home the £250 prize for his project. Sean Looji created a wearable device able to detect the onset of Parkinson’s tremors. Prompt detection of tremors means that treatments, such as deep brain stimulation can be facilitated. Sean was the second runner up and took home the second £250 prize.